What’s the old adage, “rumors of my demise are greatly exaggerated”. Yes, I’m still breathing, but to be honest, I am wearing down fast. I’ve commented a lot about my busy schedule as of late and we are now in the pinnacle of stress and deliverables. I am in the middle of a 4 half marathon race stretch (in a little over 6 weeks) and more pressing at the moment is our huge Halloween Haunted Trail event is this Saturday night. I’ll catch you up if the total lack of sleep doesn’t take me out before then. My apologies to all my blogger friends for not getting to all your posts for a while now – promise will get caught up as soon as Sunday makes it here. For now, need to get another task out of the way – introducing my little red friend from Colorado. 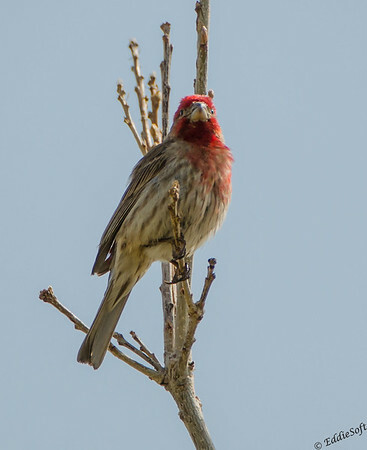 That colorful bird is called a House Finch. I found it while hanging out at the Jefferson County Fairgrounds which I think is technically in Golden, but it is just outside Denver, Colorado. Linda and I were out there to run our furry children at the Teacup Agility Nationals back in May 2014. 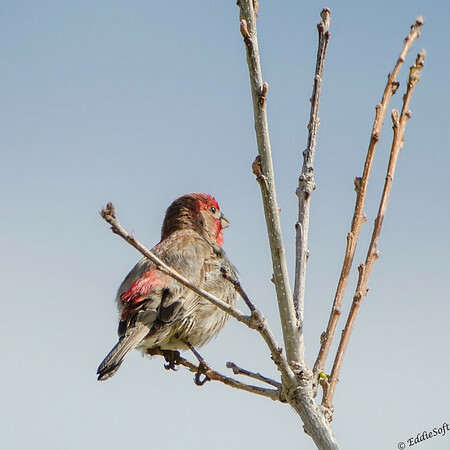 Hit the jump to read more about the House Finch. I must say, that is a pretty nice fairgrounds and as far as birding goes, it definitely kept me busy as I walked the grounds between dog runs. This particular set of pictures was taken near one of their arena buildings down the hill from where all the activity was occurring at the event. They happened to be area that had a few trees growing up between some metal buildings. This provided a perfect place to hang out on a branch and watch the day go by. 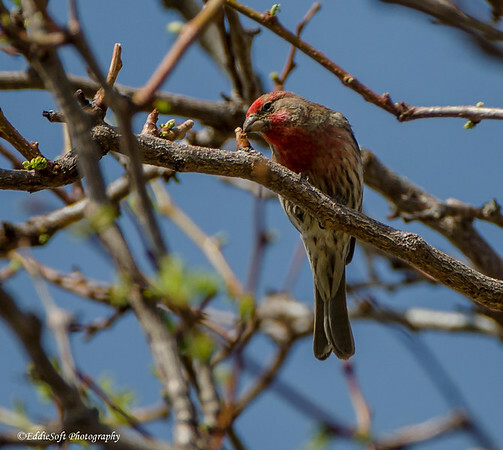 As with a number of species in the feathered category, the House Finch males get to sport the pretty coloring. The red that adorns them makes them very easy to spot in the field. Contrast that with the rather boring brown based palette of the female above. Thus one of my golden rules while out in the field – get everything you see in the area in the tin – if you can get them with their mates you have a tremendous advantage when trying to finalize the ID. You might have noticed that that the specimen above doesn’t seem as colorful as the previous male. In fact, you might actually notice some yellows mixed in there. The rest of the features all line up other than that – thick short bill, dark brown streaks, forked tail etc. While validating the ID of this featured bird, I learned something new – not so much that the coloring can very from male to male, that I knew, but now I know why. The variation comes from their diet. The more pigments (cartenoid) contained in its food the more distinctive and brighter the red. 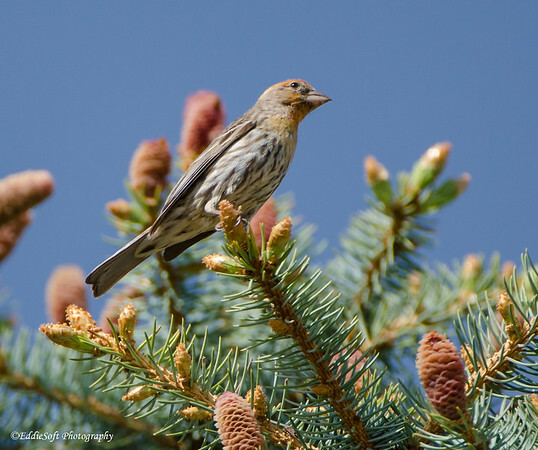 This is also a chick beacon since female House Finches compete for the most colorful males. Looks like this one better get on the stick or it’s going to be a lonely winter. Better get to some interesting facts before I have to close out this post (necessity warrants some shorter posts to hopefully close out this month on goal target – fingers crossed). 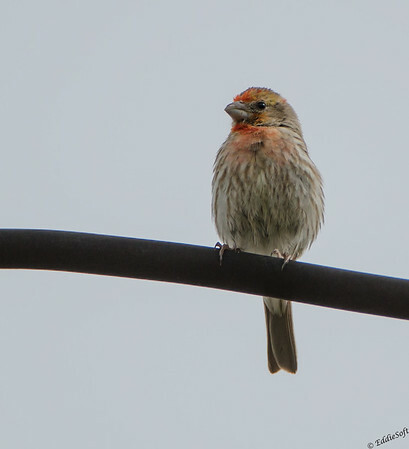 First off, the House Finch is doing quite well on the population front. 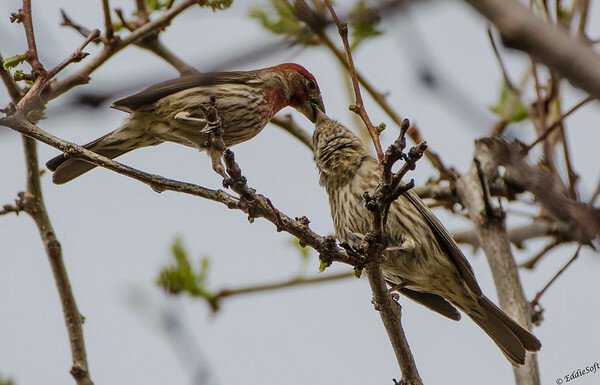 These Finches range in the staggering 260+million to 1.4+ billion – yes, that is with a ‘b’. Something to be said for birds that can adapt easily to human sprawl. Amazing when you consider they were pretty much confined to the Western US and down into Mexico until a domestication attempt failed and they ended up releasing a bunch in Long Island New York back in 1940. Hey, get a room!!!! hehehehehe. This male was busy sharing food with his lovely mate. I thought this might be extra food to pass on to offspring, but after about 20 minutes or so of watching, neither one gave any indications there were younguns to tend to. Figured I’d put a fitting end to the post…. Sorry, bad joke – really just wanted to give you the back view to point out the red patch that also adorns the base of the tail feathers. Oh, almost forgot. 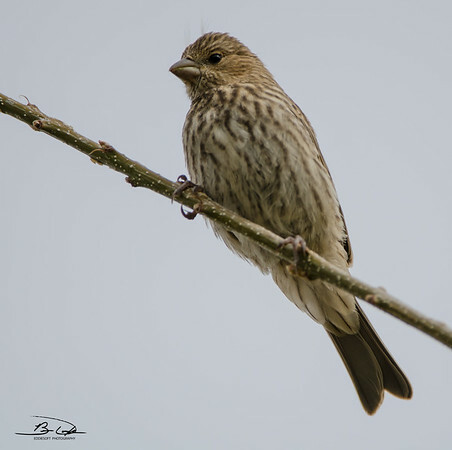 I you are having trouble distinguishing this from the Purple Finch, simply look at the coloring on the stripes – Purples have reddish streaks where the House sports brown streaks. 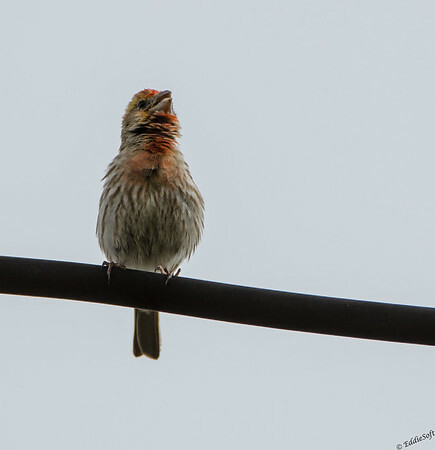 Nice piece about this finch. Ha! the hours are ticking away now and there are waves of anxiety followed by washes of panic I’m not going to get everything done in time for this party. On a side note, I do feel like I am reliving my college years when I rarely had time to sleep. Thanks for stopping by and my apologies for my delays on your work as of late…. will get there, trust me. Always look forward to your postings, super shots as usual. Thanks Brian! Word on the blogosphere is you might have been reunited with your camera – can’t wait to find the time to get over there and check out your latest offerings. Yes It’s true, I’ll put another post up sometime Sunday.